Course Duration: Bachelor of Technology [B.Tech] (Computer Science and Engineering) is 4 Years. Duration Course Duration of Bachelor of Technology [B.Tech] (Computer Science and Engineering) is 4 Years. Employment Roles Software Engineer, Software Developer, Programmer, Systems Engineer,Product Engineer, Consulting Engineer, IT Support as Associate/Fully Fledged. Bachelor of Technology is an undergraduate degree offered in the field of engineering. It is one among the most sought to degrees in the whole world. Aspirants can complete the degree within 3(Via Lateral Entry After Diploma) to 4 years which depends on the university or institute. Computer Science & Engineering is a discipline that integrates several fields of electrical engineering & computer science required to design, develop & troubleshoot computer hardware, software & networks. The B.Tech syllabus covers much of the Essential Concepts and Skill's needed to develop oneself into a Computer Engineer. 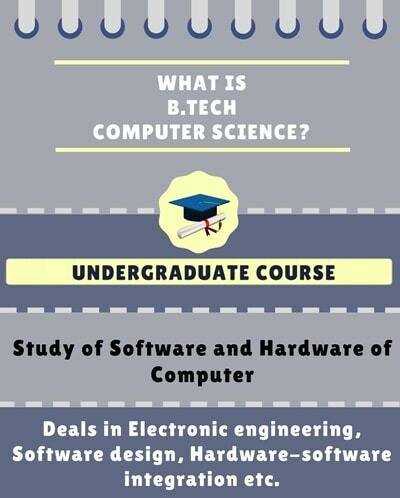 Computer science part of the course deals with the theory, experimentation, and engineering that form the basis for the design and use of computers. Computer Engineering Part deal's with tasks involving computer engineers such as writing software and firmware for embedded microcontroller and designing operating system's, etc. Many institutions like IIT Kharagpur, BITS Pilani, IIT Bombay, etc are among the top B.Tech colleges in India that offer Computer Science & Engineering course. The B.Tech Jobs and Scope Is well versed from design to development to testing of software. What is Bachelor of Technology [B Tech] (Computer Science and Engineering)? Electronic engineering mainly focusing on digital aspects. Evaluating the software that makes our computers work. New computer software and design models. As Well as how these all Components integrated into the larger picture for end user’s usability and design goal of the development team. A computer engineer may also be responsible for constructing and managing an organization's computer system and supplying technical support in their jobs. Instead of only Computer Concepts that one learns in course like BCA/ B.Sc Computer Science. Work Environment: A computer engineer typically works in an office or laboratory environment as part of a team and enjoys a traditional work schedule during the job process. 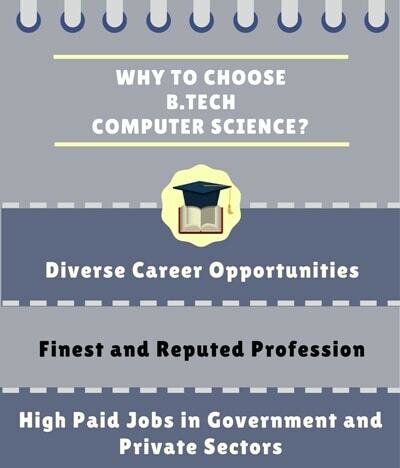 Why choose Bachelor of Technology [B. Tech] (Computer Science and Engineering)? The technology sector is booming, thus the demand for computer science engineers is more than ever. This course helps the students become professional computer science engineers. After passing out successfully, an individual can earn an average salary package of more than 5 lakh per annum. For B.Tech the minimum eligibility for which is an intermediate (10+2) with subjects such as Physics, Maths, and Chemistry. The minimum cutoff for most of the colleges is 50-60%. Most Admissions to B.Tech Course is by JEE Ranking And the Exams Has Two Levels: JEE Mains & JEE Advanced. The JEE Mains paper will contain 180 questions with option of appearing for either offline as well as an online mode of test. This will be an objective type paper and will consist of physics, chemistry and mathematics questions with MCQ Type Questions with 4 option’s with negative marking of -1 for each wrong answer and 4 marks for each correct answer. The duration of the test of 3 hours. The JEE Advanced paper will be offline, OMR sheet based paper, The questions will be 3 type-MultipleChoice Questions, Numerical Aptitude Type and Match the cases with the same negative marking scheme. 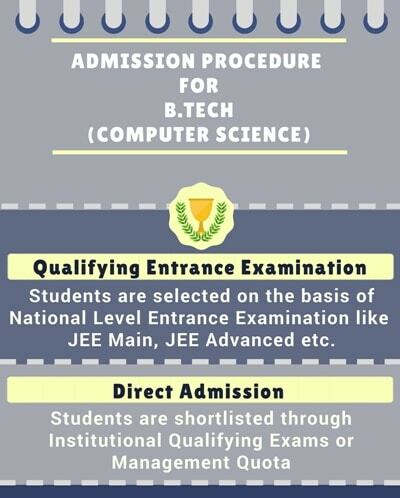 Admission to B.Tech Computer Science & Engineering program is through both entrance examination result which on merit-based. Certain universities offer both direct admission and entrance based admission to the program. However, few Universities require Candidates to have given any of the applicable Entrance Exams for B.Tech Computer science & engineering, while some colleges have their own private exam for admission to this course/any B.Tech course. 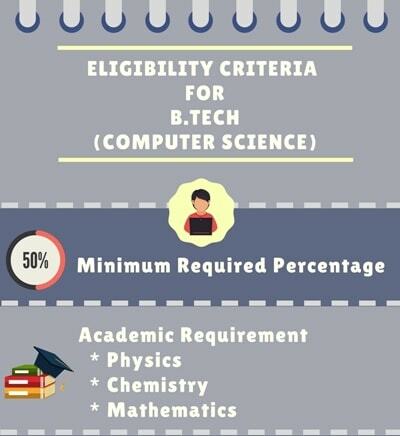 Candidates who are applying for the B.Tech Computer science & engineering programme should beforehand have their results from the respective Entrance Exams required by the selected/opted Universities. Applications for admissions can be availed either from the University website or by visiting the Admissions Office of the same. Candidates are advised to have a look at the list of Entrance Exams applicable for B.Tech Computer science & Engineering for various Universities. Candidates should also make sure they qualify in the Education Eligibility criteria with the minimum required marks and cut-off rank.